Alan Rickman was a classically trained stage star and reliable screen villain for decades. He’s best known for his work on Die Hard and the Harry Potter series of epic films. He was also memorable in Robin Hood: Prince of Thieves. 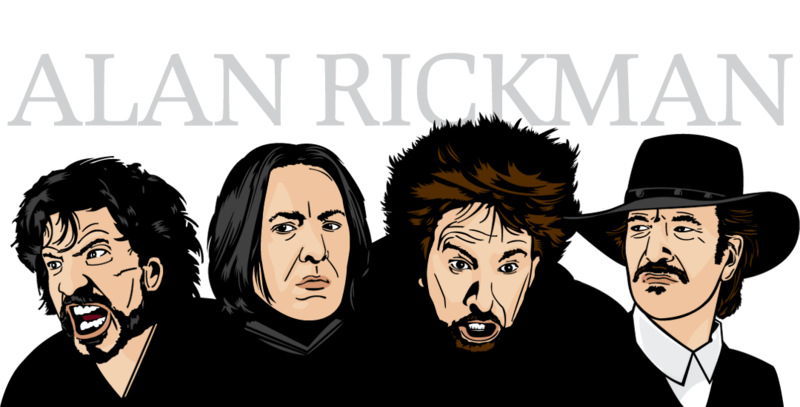 Trained at the prestigious Royal Academy of Dramatic Art, Rickman’s screen roles were remarkably varied. His movies include Sense and Sensibility, Truly Madly Deeply, Quigley Down Under, Galaxy Quest, The Hitchhiker’s Guide to the Galaxy, and Sweeney Todd: The Demon of Fleet Street. He won a BAFTA for his role in Robin Hood. Rickman is due to appear in two yet-to-be-released films: Eye in the Sky, with Helen Mirren; and the animated Alice Through the Looking Glass. He also spent plenty of time on the stage. He was the lead, Vicomte de Valmont, in the 1985 Royal Shakespeare Company’s production of Les Liaisons Dangereuses. When it moved to Broadway in 1987, Rickman received both a Tony Award nomination and a Drama Desk Award nod for his performance. Other stage roles include support in A View from a Bridge, Romeo and Juliet, Noel Coward’s Private Lives, and Antony and Cleopatra. On television, he received a Golden Globe and an Emmy Award for Rasputin: Dark Servant of Destiny. Though he played mean-spirited parts through much of his career, Rickman showed his charity while acting as honorary president of the International Performers’ Aid Trust, an organization that alleviates poverty in some of the world’s toughest conditions. Most of his peers found the British actor to be gracious and kind. Particularly saddened by the news of his passing were author J.K.Rowling and actress Emma Thompson. The immensely talented Alan Rickman (right) was 69. This entry was posted on Friday, January 15th, 2016 at 12:11 am	and is filed under Blog by Manny Pacheco. You can follow any comments to this post through the RSS 2.0 feed. Responses are currently closed, but you can trackback from your own site.